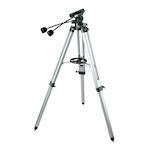 Celestron offers a variety of tripods from astronomical style with fine-tuned altitude and azimuth controls to basic tripods to a 4-section aluminum model with a video head with balancing plate. The Celestron standard tripod for spotting scopes is aluminum with a 3-way panning head, horizontal and vertical levels and a geared central elevator. It has a folded length of 27 inches, and a maximum height of 63 inches. The heavy duty Alt-Azimuth tripods are designed to support the greater weight of astronomical optics, and features slow motion cables for adjustment of azimuth and altitude.